Our company (PTC) has devoted to create these tour programs to give tourists an accurate understanding of the North Korean regime and the implications of its policies and philosophy on the countries around it, as well as the rest of the world. 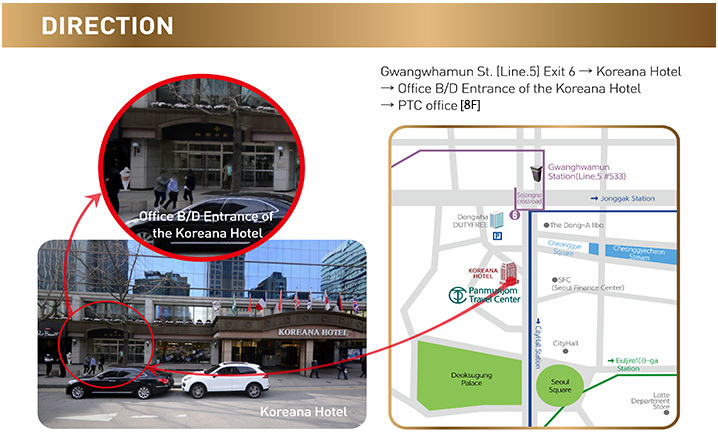 1.Departs Tuesday Through Friday at 09:30am from the Panmunjom Travel Center in Koreana Hotel, Sejong-daero. Please note: tours are prohibited on Military training days and National Holidays. 2.Panmunjom is located inside the Demilitarized Zone (DMZ) and is the closest location to North Korea for visitors to see. The tension is very high and only a limited number of people are allowed to visit Panmunjom at one time. 3.Unique program only provided by Panmunjom Travel Center(PTC). This will be a special opportunity to experience the reality of North Korea and attain a better understanding of the situation. North Korean defector will brief about life in North Korea before visiting the JSA. “Today, Tomorrow and the Reunification of the Korean Peninsula. 1. Accepted currencies for Cash are KRW, USD and YEN only. 1 According to the UNC rules the roster of the tourists to Panmunjum should be reported 48 hours (2 days) prior to the tour briefing time (13:45) in the camp Bonifas on the tour day. So person who is interested in this tour should send your name, passport number and nationality to us at least 3 days before. 5.The cameras with over 90mm zomming lens are not allowed.